is a collection of web application security testing tools that complement the feature set of current web proxies and automated scanners. CAL9000 gives you the flexibility and functionality you need for more effective manual testing efforts. Works best when used with Firefox or Internet Explorer. XSS Attacks - This is a listing of the XSS Attack Info from RSnake. You can filter the listing based on which browsers the attacks work in, test them, apply RegEx filters and create/edit/save/delete your own attacks. Http Requests - Manually craft and send HTTP requests to servers. GET, POST, HEAD, TRACE, TRACK, OPTIONS, CONNECT, PUT, DELETE, COPY, LOCK, MKCOL, MOVE, PROPFIND, PROPPATCH, SEARCH and UNLOCK methods supported. Send single requests or launch automated attacks with more than one request at a time. All results are saved in a history file. 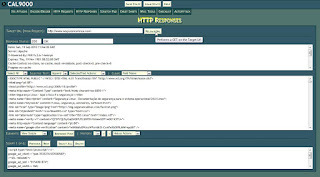 Http Responses - View the status codes, response headers and body. 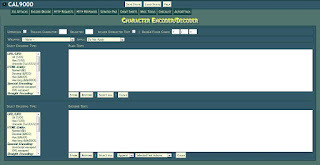 Isolate the script, form and cookie information in the response. Scratchpad - A place to save code snippets, notes, results, etc. Cheatsheets - Collection of references for various web-related platforms and languages. IP Encode/Decode - Go to/from IP, Dword, Hex and Octal addresses. String Generator - Create character strings of almost any length. Scroogle Search - A privacy-friendly scrape of Google results w/Advanced Operators. Testing Tips - Collection of testing ideas for assessments. 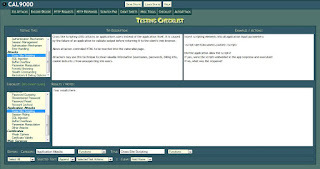 Testing Checklist - Track the progress of your testing efforts and record your findings. The checklist categories roughly correlate with the Manual Testing Techniques from the OWASP Testing Guide. Create/edit/save/delete your own checklist items. AutoAttack Editor - Create/edit/save/delete the AutoAttack Lists that are used to drive the automated multiple-request capabilities on the HTTP Requests page. Store/Restore - Temporarily hold and retrieve textarea and text field contents. Save/Load State - Allows you to save CAL9000 textarea and text field contents and reload them when you are ready to resume testing. Selected Text Processing - Allows you to process selected text inside of a textarea instead of the entire contents. LATEST RELEASE - Version 2.0 released November 16, 2006. See the OWASP CAL9000 Project Roadmap for release notes. 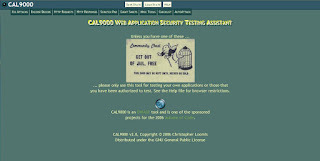 Click here to view the CAL9000 source code. I appreciate the effort, knowledge and time you have given for writing this wonderful article in order to explore the concept of the web application security testing tools.